The state capital of California, Sacramento is a tree-rich hipster place for many, but when you’re a broke tantrummy teenager stuck in a Catholic school with low grades and a University place well off the table, the location is unimportant. 17-year-old teenager Christine (Ronan) hates her home town, and insists on being called “Lady Bird,” much to the chagrin of her stressed-out, ever-worrying mother Marion (Metcalf). They argue constantly, and – unknown to Lady Bird – things are close to crisis in their blended family home as dad Larry (Letts) looks like he’s about to get laid off. 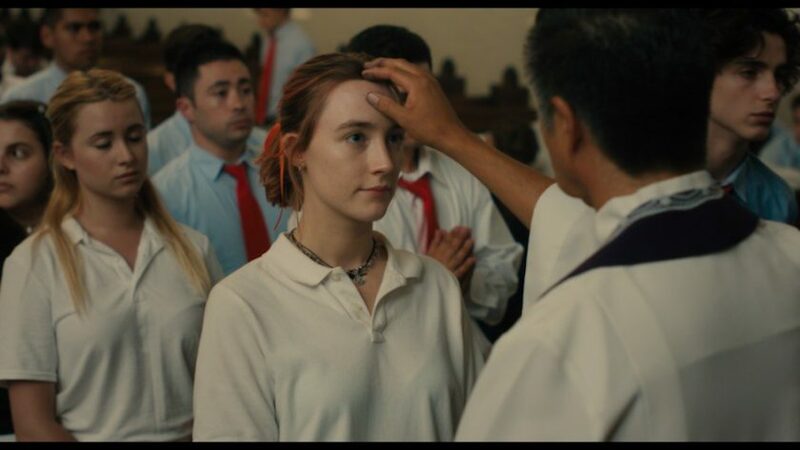 Meanwhile, Lady Bird nevertheless has fun with her bestie Julie (Feldstein), and when they join the school musical and Lady Bird falls for Danny (Hedges), things are looking up – though spending Thanksgiving with Danny’s well-to-do family upsets her mum no end. They argue more, and when Lady Bird loses her virginity to roll-up smoking pseudo-intellectual Kyle (Chalamet), who is very much part of the cool clique, poor Julie gets dumped like a hot potato. Lady Bird then learns she’s on the waiting list for a university in New York, and sets out happily for the big year-ending prom with Kyle and his pals – but is that how she wants this period of her life to end? A coming-of-age tale that takes place in 2002 – long before teenagers lost themselves on their phones – the directorial debut of Gerwig was originally a mammoth-length script that she says wasn’t autobiographical, even though she was born in Sacramento. It certainly shows that Gerwig is a young talent well on the up. She’s been acclaimed for both her writing and acting already, and is getting plaudits here too. Ronan is also getting nods for her performance, walking that fine line of being empathetic and real, annoying and showboaty, and sometimes rather loveable – all while being an often-irritating teenager. Metcalf – better known for her extensive award-winning work on the stage and as sister Jackie in the many series of “Roseanne” – is great too, mixing the overbearingness of a parent with subtle moments that allow her to be more than just Lady Bird’s greatest critic; the airport scene was a tear-jerker. Either way, Lady Bird is a great entry in what’s a tricky genre: strong performances from the entire cast, a crisp, dramatic, emotional and amusing script, and a fluid directorial style that makes full use of the locations and indeed makes you change your mind about Sacramento (just like Lady Bird does).